In about the third grade, you are taught cursive and from there until you finish school, you are required to write in cursive. As an adult, why is it that every document or form you fill out says "Please print"? I was in college and 2 of my high school friends were there. Matthew Fox was in my class (yes, from Lost). I was embarrassed because my friends were acting just like they did in high school, and I had a crush on him. He was listening to the instructor intently. I wanted to talk to him, but I was invisible to him. So, my friend hands me this shoe box FULL of candy. I dig around and get a piece out, and then I say "Matthew, do you want some?" He looks at me as if I just completely annoyed the hell out of him and shakes his head no. Would the dream have gotten worse or better? I have another one....I have a recurring dream that I smoke. I have had this dream over several years. I have never smoked in my life. The one time that I tried, I couldn't inhale : ) and I have always thought it was disgusting. I hate the smell of it, and I hate being anywhere near it. In my dreams, I am loving that I smoke. In fact, I am enjoying the heck out of it. Sometimes I try and hide my cigarettes, but I cannot wait to smoke one. I am usually doing it around someone that I am mad at. I work with a girl who is attractive and she dresses nicely. We don't hang out, but we occasionally talk, sometimes at length, when we are both walking out at the same time. She is pretty nice and I enjoy talking to her, BUT, everytime she sees me for the first time that day, she gives me 'The Look'. Ladies, you know what I am talking about. The not-too-fast, not-too-slow, once-over from head to toe. Like she is the Queen and I am one of her subjects, and she needs to see if I pass inspection--that kind of look. It usually happens at the printer, and it annoys the heck out of me! She is not the only one who has ever done it, but she does it the most. Is this something other women conciously do? Does she want me to notice 'The Look'? Because it is obvious! I am just waiting for her to do a thumbs-up or thumbs-down one day. What is up with 'The Look'? 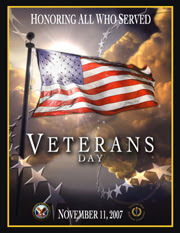 Thanks to all who have served! WE salute you! So, the writer's in Hollywood are on strike, right? I had this horrible thought that LOST might not air in 2008. Sure, they have written episodes, but who knows how many. Jack is sitting on the bed with his head in his hands when he picks up the phone and dials it again..."Kate...Kate, please listen"
"Do you not think that it is strange that 3 people have died in 2 weeks since we have gotten off the island?" silence..."I know, Kate, but think about it...I can't, I can't bear to think that you might be next." WOOSH to the island where Sawyer is walking throught the woods and comes up on Kate and Hurley. Kate's tank sleeve is pulled off her shoulder and Hurley is touching her shoulder. "Well, well," Sawyer says, "looks like All You Can Eat is having himself a side-dish of Freckles." Hurley jerks his hand back. Kate glares at Sawyer and storms off. "It's not what you think, dude." Hurley says. Sawyer ignores him and takes off after Kate. "Leave me alone, Saywer." Kate demands. "Relax, Freckles. Nothing about the competition that I can't handle," he grins devilishly. As they walk along, they hear screaming from the beach. They both run to find Sun standing beside the graves of Nikki and Paulo. The graves are empty and they are nowhere to be found. A few of the other islanders are standing there. "What the hell happened?!" Sawyer screams. "I just came back from my garden, and I heard a lot of noise. When I came over, this is what I found, "Sun replies. "Do you think it's 'The Othas', brotha?" Desmond asks. John Locke appears out of nowhere. "It wasn't 'The Others'," he says. "How do you know?" Kate asks. "Remember the black smoke? It came up and made an awful sandstorm. When everything cleared, they were gone. I saw the whole thing." John says. "Well, we need to go find them." Kate says. "Dude, I don't know about that," Hurley replies. "I'm not chasing some sandstorm for a couple of dead people. Besides, how do we know it isn't a trap by 'The Others'?" Sawyer says. "You people have a great fear of the black smoke, but the island takes care of itself. The smoke drug me off. Why? Because I was scared. Now, I know. It is just smoke. Eko never feared the smoke, and it left him alone. You people...you are running from yourselves," John speaks softly. "Ok, Kojak, then you go follow the black smoke," Sawyer starts to leave the beach and mumbles, "Now, I know you have completely lost your mind." "Have you been brainwashed by 'The Othas' brotha?" Desmond asks. Jin says something in Korean and all look at Sun. "My husband says, "John makes perfect sense to him." WOOSH Back to Jack in his bedroom. Someone knocks at the door. It's Sun. "I heard about Sawyer," she says, "Am I too late?" "The funeral was yesterday," Jack replies. "Sun," he pleads, "Kate won't listen. We have to go back. We all have to go back!!" "What will that do, Jack? It doesn't make sense." Sun says. "Don't you see? We came home, and we are dying....one by one, we are all dying." "Jack, where did you get that.......motorcyle?" she asks breathlessly. "I found it between the hot air balloon and the twin engine plane...but, nevermind that, is Kate coming this way?" "I am tired of playing mister good guy doctor. I love her, and I will do anything to get her, that's all." "Well, if she doesn't take you up on your offer, I will be in my garden," she smiles sheepishly and disappears into the jungle. Back to Kate and Sawyer. "So, Freckles, tell me it ain't so. You sweet on Jabba?" "Stop it Saywer. I don't owe you an explanation. Now outta my way. I have to go beat up the black smoke and save the two dead kids." Sawyer grabs her arm, "What are you so uptight about? A few nights ago you were all about me. What have I done to deserve this cold shoulder?" "Just so you will get outta my way...I ran into Hurley pretty hard, and it hurt my shoulder. He was making sure I was ok."
Sawyer smiles, "Can I expect you to jump my bones tonight? If so, I'll make sure I wash up just before." Next, we see Hurley's van. Kate and Hurley are inside. "So, did you tell Sawyer anything?" Hurley asks. "No," Kate smiles, "I told him you ran into me." Hurley sticks his head out the window and yells "HEY SAWYER!! Don't come knockin' when the van's a rockin'!" No, this is not Death Valley. It is actually Lake Allatoona (North Georgia). Some of you know, we have an extreme drought situation in North Georgia. Actually, I believe it is categorized as "exceptional" now which is worse than "extreme" in drought lingo. This past weekend, my family ventured out to the nearest lake. If the weather reports didn't get your attention, this surely would. You can see the line of gravel behind them. This is where the water line normally is. We are 21 feet from a crisis situation. Our govenor has made a trip to Washington, but I believe that resulted in a lot of beauracratic nonsense. As you can see, we do not have the pretty fall colors that we normally would at this time of year. I have no idea what this was, but my daughter insisted that I take a picture of it. Theories were: old pot, weird toilet seat, ancient Indian bong (not sure how that would work). We didn't see this deer, but here is evidence that they were lurking around...(We actually saw one later that day running across the road in front of our car). This is the bottom of the lake. So, all of these pictures are to say...some people are getting hit really hard now (see Its-a-pugs-life blog). The city and state workers are being asked to not wash their hands which is completely ridiculous. Some of the landscaping companies are being completely restricted, and it is threatening their jobs. We all have a part in this. We take water for granted, and we shouldn't. We rely on the government to fix things like this so it doesn't inconvenience us. When is the last time the government did something efficiently? Pray for rain. The last time I checked, God controlled the rain. Conserve water. Do whatever you can now. Our day ended at Cooper's Furnace day use area. Here is a picture of the furnace. For those of you not too familiar with Civil War history, this was an iron manufacturing furnace which was sold to the Confederate States in 1863. Sherman destroyed it with the rest of Atlanta in 1864. There are a few around this area, but most of them are under Lake Allatoona. We may soon be able to see them if this drought continues. I have been trying to decide about entering the Education field for years now. I am one of those people that have to ponder things for a long time, but this is going on years. I have taken the first part of the teacher's certification exam, and because Math teachers are in such demand, even though I do not have an Education degree, I can take the 2nd exam and eventually become a teacher (there are a few dues to pay first ;) I had a little interruption in my plans 3 years ago when I became pregnant. But, now I am, again, thinking about the leap. But, I am stuck between a rock and a hard place. It is a huge salary cut to become a teacher. Also, we have insurance through my company which is much cheaper than with hubby's. I have a pretty flexible part-time schedule where I am now, but I am so disenchanted with the corporate world. I have been in the same industry for over 20 years! And, I really have a heart for kids who are struggling in Math. I talked to a substitute teacher today at a kid's birthday party (of all places!). She substitutes for my daughter's class sometimes. She talked to me about becoming what is called a "supply" teacher first which is what she does now. This is substituting for long periods of time for teachers who are on short or long term disability. You must have a degree which you do not have to have to be a substitute. I keep trying to figure out how to do it. I have prayed about it for years. I do feel encouraged, and maybe I just need to jump. But, at this point, I think it would be easier if I were pushed!